A Large front and back yard welcome you to this three bedroom, two full baths (one with a jacuzzi tub). 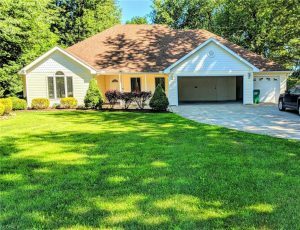 This well maintained vaulted ranch has updates throughout that include, new carpet, fresh paint through its entirety, and an open concept–it’s first floor living at its best. Stamped concrete front porch and a three season room for relaxing as each beautiful view can be seen through Pella windows. Back yard backs to a nursery. Kitchen has a breakfast bar.